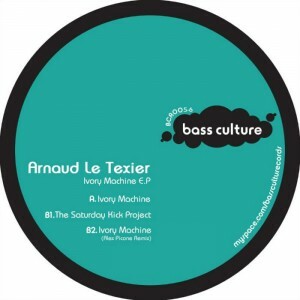 Arnaud Le Texier is now a regular spinner at some of Europe’s finest, underground nightspots. His productions and remixes have found homes on superb labels. In 2009 already Arnaud has released and remixed for Children of Tomorrow, 20:20 Vision, Robotronic and SCI+TEC Digital Audio. Today’s E.P. opens with the title track. Deep and hypnotic, its long atmospheric intro leads us to its key stabs, and the tougher kick drum. Each sound is beautifully layered to create the complete opener. On the remix of ‘Ivory Machine‘ is Alex Picone. Fresh from the success of his own Bass Culture release, the ‘Thai E.P.’ and in sparkling form, Alex maintains the original’s elemental structure, ups the tempo and adds some powerful snare and cymbal work. Finally, and rounding out the E.P. is ‘The Saturday Kick Project‘. ‘Kick’ is most definitely the predominant word here, from the power of the opening few bars we know we are in for something heavy. With an almost warehouse feel, the weighty beats are matched with spacey sounds and percussion that work perfectly together. This entry was posted on January 7, 2010 at 08:00 and is filed under Release.